Through correct naginata instruction, practitioners will improve their technical skills, cultivate their minds, increase vitality and develop physical strength. They will also uphold elements of traditional Japanese culture embodied within the art of naginata, retain discipline, show courtesy and respect, value fidelity, and with resolution will strive to become a useful member for a peaceful society. 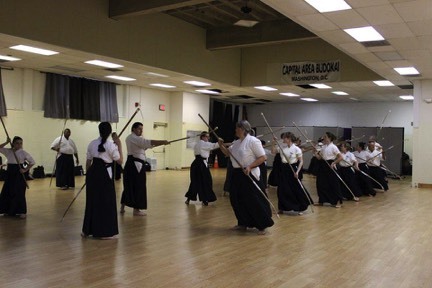 Some of our dojos practice two styles of Naginata training. In the gendai (modern) tradition,we offer Atarashii (“New”) Naginata, which is naginata vs. naginata in both paired forms practice,and sparring in bogu (protective body armor); in the koryu (“classical/ancient styles/schools”) tradition,we offer Tendo (“Way of heaven”) Ryu Naginata-jutsu, which is a kata- or forms-based art of primarily tachi (old-style Japanese “sword”) vs. naginata. “New” Naginata is a fulfilling tradition, practiced by men, women and children; it combines the two sets of forms with regulated sparring in bogu (protective body armor). Regional, national and international tournaments are held for both forms and sparring. The art of Naginata is unique in that it emphasizes training on both sides of the body unlike many other forms of weapons arts; as with other arts, it emphasized the development of body, mind and spirit along with their integration. Bogu work is delayed until such time as the trainee is sufficiently grounded in the basics of moving and manipulating the naginata. We invite people of all levels and skills to join us in practice. The naginata is perhaps the most famous polearm of Japan. It was used by the buke – the warrior class of Japan – for several centuries. It became part of the traditional progression of an ancient battle, surpassing the sword as the weapon of choice for men in large scale combat. Samurai women learned its use to defend the home and castle. The original kanji characters for naginata meant ‘mowing’ or ‘reaping sword’ because the blade is made in a fashion similar to the tachi (old-style cavalry saber) and katana (new-style less-curved saber), although it has developed its own series of characteristics over the centuries. Like many polearms, the steel blade was attached to a long wooden shaft – perhaps 2 meters or more in length. Its length added reach and leverage, making it deadly against mounted and armored opponents. During the peace of the Tokugawa shogunate (1603-1867), it became the traditional weapon of samurai women (as the katana had become the traditional weapon of samurai men), and was often part of a samurai daughter's dowry. 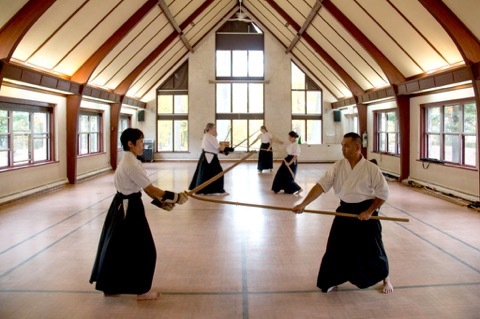 There are many traditional ryuha (“schools”) that still teach the old naginata kata, using wooden naginata, just as kenjutsu (“sword arts”) schools might use bokuto (“wooden swords”). Although not officially part of Atarashii Naginata, we do sometimes engage in Isshu Jiai (“mixed-weapons sparring”), in this case, Naginata vs. Kendo, that is, naginata vs. shinai (“bamboo sword”). Kata is designed to teach the correct form of the basic techniques of the weapon. The rendition of Naginata used here is carved from oak to more fully represent the original weapon, complete with mock blade. 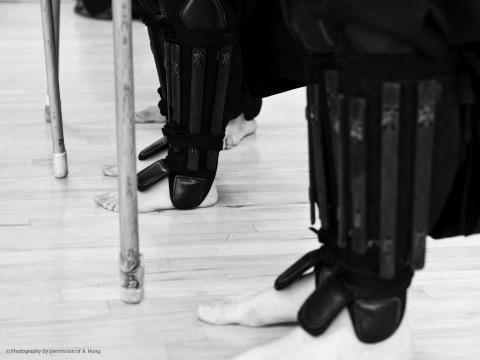 In Shiai, protective equipment similar to that worn in Kendo is employed, with the addition of Suneate (shin guards). The naginata used in Shiai is comprised of a light, oval, oak shaft topped by two strips of curved bamboo. The end of the shaft and bamboo tip is protected by a small leather sleeve. In the daily practice of Naginata, we enlist various training methods. For example, Shikake-Oji is a series of pre-arranged movements, each involving a sequence of attacks, parries and ripostes. Eye contact, Kiai (an aspect of breath control resembling a shout) and Zanshin (mental alertness) are also integral. Tendo (“Way of heaven”) Ryu Naginata-jutsu is a kata-based art of primarily tachi (old-style Japanese “sword”) vs. naginata – it is one of many koryu (“classical styles”) for naginata training. At the Capital Area Budokai, we have the Shutoken (“Capital Area”) Tendo Ryu Dokokai (study group, literally “meeting of like-minded people”). Students are typically members of the governing organization for Tendo Ryu, Shingetsukai in Itami, Japan, although this is not required, and we do work under the guidance of Shigetsukai instructors. Tendo Ryu is a koryu whose origins extend back to the Sengoku Jidai (“warring-states period”) [1467-1603], and was founded in 1582. Because of this, kata are based on both people being in yoroi (Japanese armor) – the naginata is used to exploit weaknesses in the yoroi coverage. Tendo Ryu has no rank, hence, no gradings; in our training, we concentrate on correct form and application in body, mind and spirits. Raymond Sosnowski, a student of Tendo Ryu since 1996, leads the dokokai. He along with Fran Vall, another local senior practitioner, have also been instructed in the tachi-side of the kata since 2008. As in other koryu, the role of uchi-tachi, the “attack” or offensive side of the kata, is restricted to senior, more experienced practitioners because it is considered to be the “teaching” side, controlling the dynamic ma-ai (distance & timing) of kata as well as the safety of both people. This practice is open to anyone; typically a student of Tendo Ryu is also a student of Atarashii Naginata, but this is not required. Tendo Ryu was one of the principal koryu that contributed to the formulation of Atarashii Naginata in the early 1950’s. 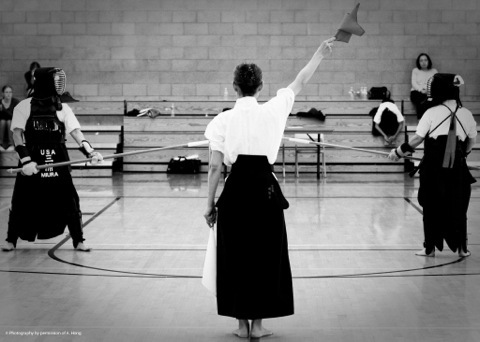 The study of naginata is to nurture people harmonious in mind and body.